Bensimon Byrne, OneMethod and Narrative PR comprise Canada’s largest independent ad agency. As experimenters and brand builders, they wanted to create an office that was truly unlike any of their competitors with a central location, and an unusual and iconic address. Designed by Toronto architects Lebel and Bouliane in collaboration with interior designers Mazen Studio, the new office is at the hear of downtown Toronto. The clients found space within the northwest corner of Toronto’s Canadian Broadcasting Centre, designed in the late 1980s by Philip Johnson. The agency was excited by the chance to appropriate a few of the original voice-over recording studios and editing suites. And they were thrilled about the incredible ceiling heights reaching up to 28 feet, as well as the warehouse-like dimensions of the concrete building which would enable them to build large-scale interior elements. With trusted collaborators in a local architecture and interior design studio, they began by removing two giant audio recording studios and a foley studio, as well as storage and office areas. 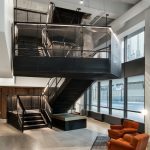 To anchor the agency at the corner of the building, the team cut an entrance establishing a united reception space with a new grand staircase that leads clients to Bensimon Byrne and Narrative PR. While OneMethod is accessed via a side gallery or an alternative side door on the ground floor, all in keeping with the agency’s low-key, urban culture. The agency asked the designers to “create a pulse” throughout the interiors. Their response was to implement urban design concepts such as “streets” “districts” “landmarks” and “stages”. The overall result is a multi-dimensional agency with an air of consistency. Each agency enjoys its own “neighbourhood”, culture and function. OneMethod has the vibe of a converted warehouse with alleyways and overhanging structures, while Bensimon Byrne and Narrative PR are more polished, enabling the agency to address the needs of their varied clients. The architect built out the landscape to give the areas gravitas, and the interior designer creative directed the space, sourced furnishings, lighting and art to soften and animate the procession through the office. In a culture of “work anywhere” the design team’s aim was to create an office where people would want to go to work, and where they could enjoy a positive and creative experience that they could not find elsewhere. The designers found inspiration in hospitality spaces that encourage collaboration and socialization. And while there are areas that feel reminiscent of a hotel lobby or a coffee shop, there are also places for making, collaborating, critiquing, staging and enjoying creative freedom. Not every space is “designed” — many are deliberately flexible for adaptation: the kitchen can be used for filming, the agora for lectures and the catwalk for fashion shows — to name just a few of the myriad of examples.